The ADS RainAlert III is a low-cost wireless rain gauge that alerts operators via text or email messages when rainfall intensity exceeds a critical threshold. Priced for deployment as a stand-alone unit or part of a comprehensive monitoring network, the enclosure is suitable for ground-level, pole-mount or rooftop installation. The RainAlert III connects to an ADS or customer supplied tipping bucket. Rainfall totals are time stamped and stored at one minute intervals or greater based on customer supplied specifications. It is easily configured and managed using ADS's FlowView software and allows instant access for retrieval of logged rain and alarm data. 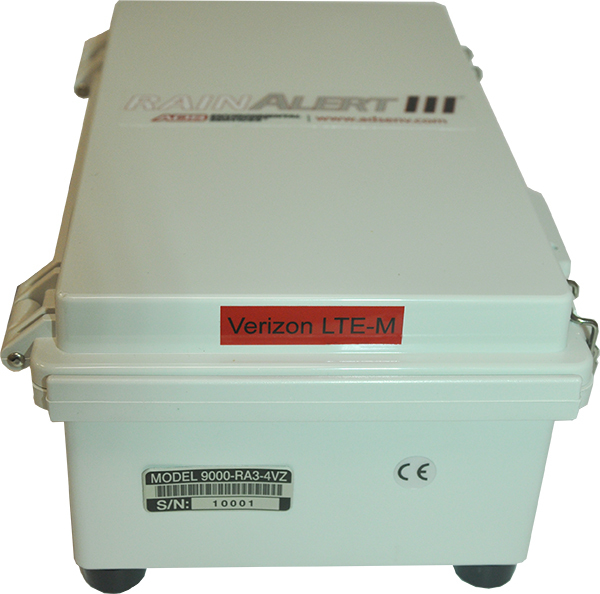 The RainAlert III provides rainfall data acquisition and intelligent alarming to support wastewater capital improvement, operations and maintenance, and regulatory programs. Applications include infiltration and inflow studies, hydraulic modeling, and overflow response and reporting. Nema Type 4X, IP67, UL Rated Polycarbonate enclosure (glass fiber resin reinforced), watertight enclosure with stainless steel hardware. Unit can be locked using padlock on sealing hasp.